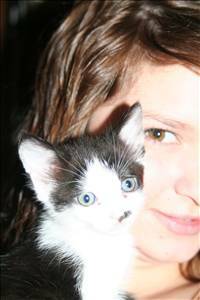 This picture is my daughter Haley, and her kitten Booker. My name is Denny and I am 49. I have to write this fast...I lost my 18 year old daughter (Haley) 14 months ago and have been laying on the couch ever since. I have not been over eating, well I haven't been paying attention to what I eat, but not moving unless I have too. I have a 9 year old son and a 7 year old daughter that I need to be there for. My husband takes them where they need to go, but I still need to do what it takes when they are home: dinner, homework, baths, etc. Which sounds easy, I wish it was. My parents are taking the whole family on a cruse in late March so I figure this is a good time if any to try and get myself on a better path. Losing that unwanted weight will help me feel better in one way, and I hope it will help in other ways. I used to be real active and I know my daughter is watching and wants me to be happy, so I just need to do it. Get my body going and hopefully my mind will follow. The 9th Law Diet has become enormously popular as so many are losing big pounds. Let's support each other.